Twitter and Mnet Asian Music Awards (MAMA), the biggest music festival in Asia, has joined hands again to engage Kpop fans worldwide on Twitter. To commemorate its 10th anniversary, MAMA's partnership with Twitter has expanded to include a brand new category -- "Worldwide Icon of the Year". This is in addition to voting for the "Best Asian Style Award" in Hong Kong, viewing of the red carpet live streams on Twitter for both Japan and Hong Kong, and joining in the #2018MAMA conversations with customised emojis. From voting for their favourite Kpop artistes/bands to keeping updated on the live events, Twitter is the best place for Kpop fans all over the world to be a part of the 10th MAMA Awards Ceremony, find out what's happening in real-time and to talk about it with other Kpop fans. WORLDWIDE FANS’ CHOICE TOP 10 will be revealed! Vote for your artist on twitter during Award Ceremony. You’ll decide ‘WORLDWIDE ICON OF THE YEAR’! 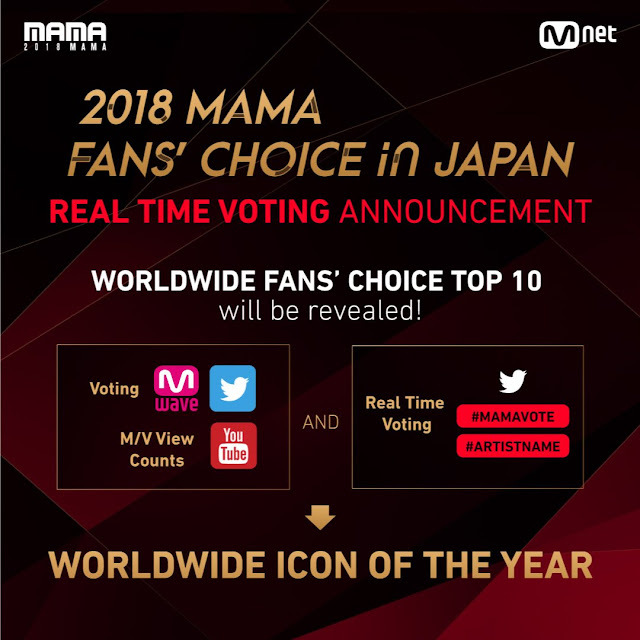 The top 10 nominees for the "Worldwide Icon of the Year" will be announced during the Fans' Choice in Japan segment of 2018 MAMA in Japan. These 10 artistes/bands shortlisted for the award were selected through a series of pre-voting based on a combination of Twitter votes, official MAMA voting on their website and Music Video online views from 1 November to 9 December 2018. Follow the MAMA official Twitter account @MnetMAMA to find out the 10 nominees in real time to start the Twitter voting process! 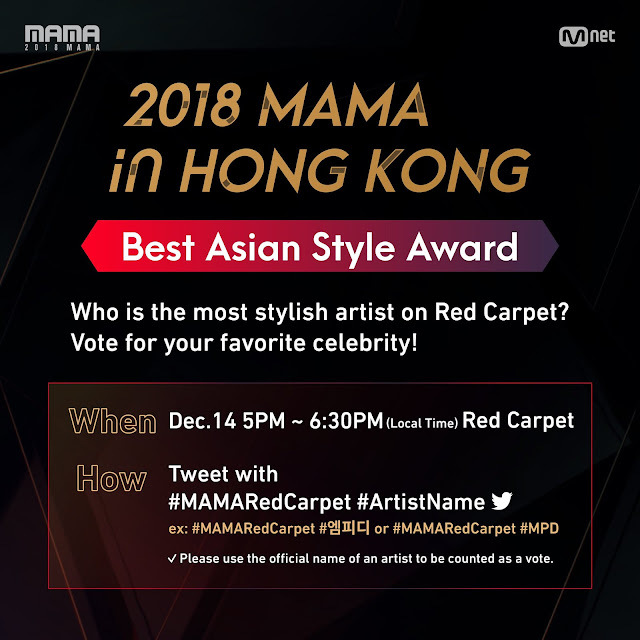 Fans can also vote in real-time on Twitter during the 2018 MAMA in Hong Kong red carpet ceremony on 14 December at 17:00 HKT for their favourite artistes/bands to win the "Best Asian Style Awards" with the hashtags #MAMARedCarpet and #ARTISTNAME. Kpop artistes/bands with the most number of Tweet votes from the red carpet will be awarded the Best Asian Style prize during the Hong Kong ceremony. Twitter launched three emojis in celebration of MAMA's 10th anniversary. Tweeting the hashtags #2018MAMA or #MAMA10 will generate a flame shaped emoji, symbolising the fans' passion and enthusiasm for their favourite artistes/bands. Tweeting #LikeMAMA will generate a second emoji, the MAMA logo in the shape of heart, to express the love from Kpop fans. Lastly, a third emoji will be of a red carpet, appearing when fans Tweet #MAMARedCarpet. Kpop fans around the world can use any of these hashtags to see and join the 2018 MAMA conversation on Twitter right now. BTS looks back their wonderful performances from <2014 MAMA>! Let's look forward to the upcoming BTS's stage at MAMA! The 10th anniversary of the global Kpop music festival is held in Korea on 10 December 2018, in Japan on 12 December 2018, and in Hong Kong on 14 December 2018. Top Kpop artistes/bands including BTS, GOT7, Wanna One, TWICE, IZ*ONE and others will be starring in this special 10th edition of 2018 MAMA. Follow the official 2018 MAMA account on Twitter for exclusive performances and behind-the-scene footage!